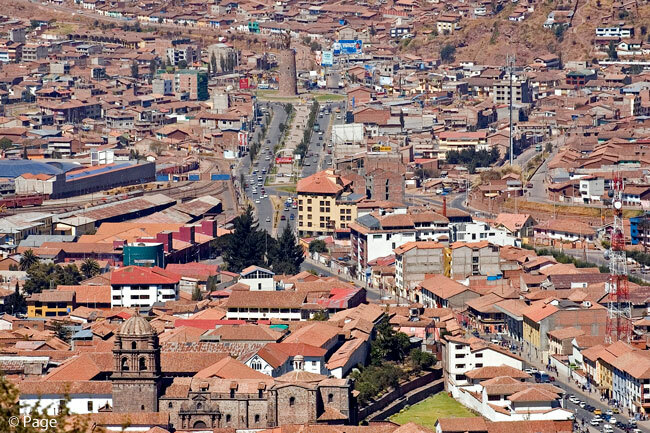 One of my favorite cities, Cuzco is located in southeastern Peru in the towering Andes mountains of South America. 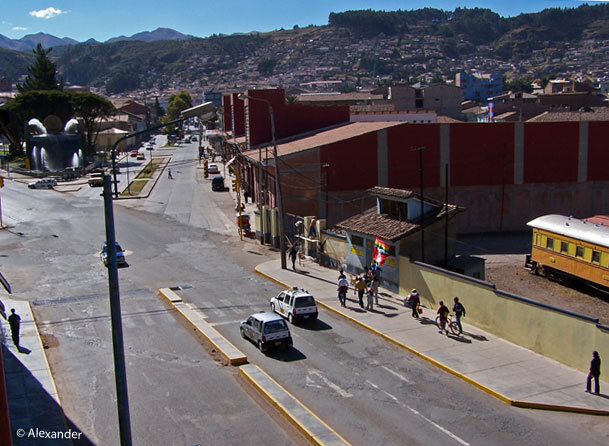 Founded in 1100 in a fertile valley, this city rests at an elevation of 11,152 feet (3,400 m). It is a UNESCO World Heritage Site. The two most notable human influences of Cuzco (also spelled Cusco) are the Inca civilization, occupying Cuzco from the 13th to the 16th Centuries; and the Spanish culture which took over in 1532. Many native cultures occupied Cuzco before the Inca, less is known. 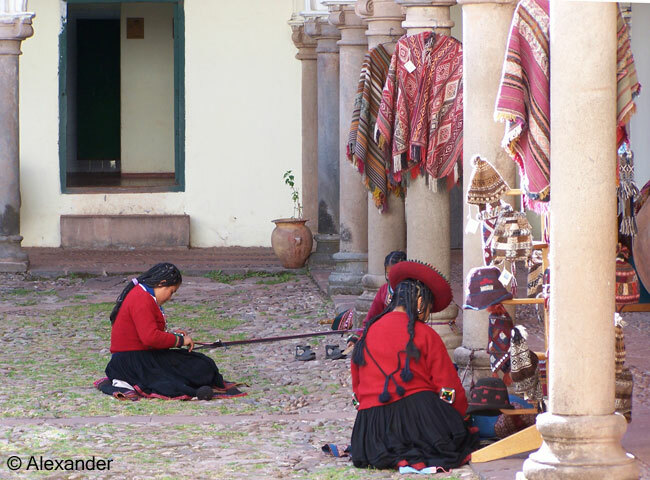 The beauty of Cuzco today is the combined cultures of the past. Another major influence of the region are the colossal Andes mountains. The longest mountain range in the world, and the highest outside of Asia, the mountains loom large in every aspect of Cuzco…as they have for tens of millions of years. Isolated by the mountains, the people of this area have perpetuated skills and crafts over the centuries. Textiles, agriculture, and an array of ancient techniques that were practiced centuries ago still flourish today. 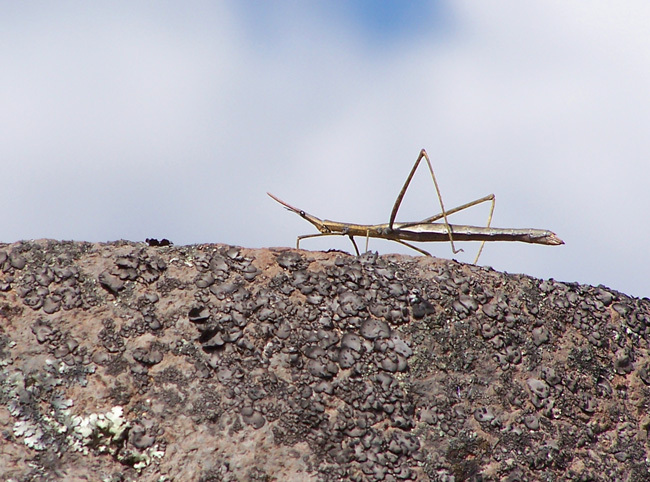 Flora and fauna are also unique to the high altitudes. 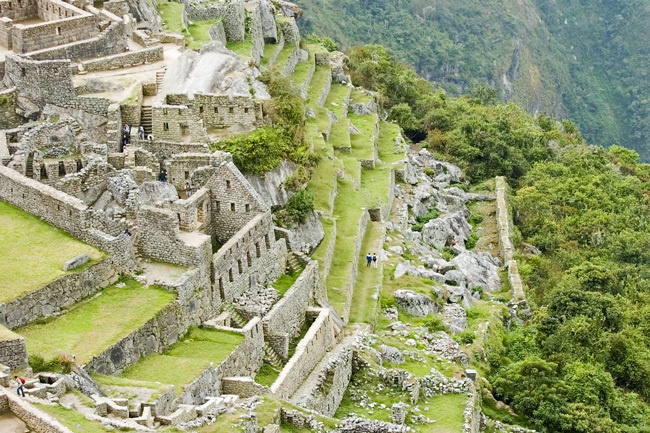 During the Inca civilization, communities were masterfully constructed. They built exquisite walls of granite and limestone, designed to utilize the commanding topography. Temples, roadways, domiciles, and aqueducts dominated the land. When the Spanish conquered the area in 1532, they built their structures over the Inca city and its magnificent walls. 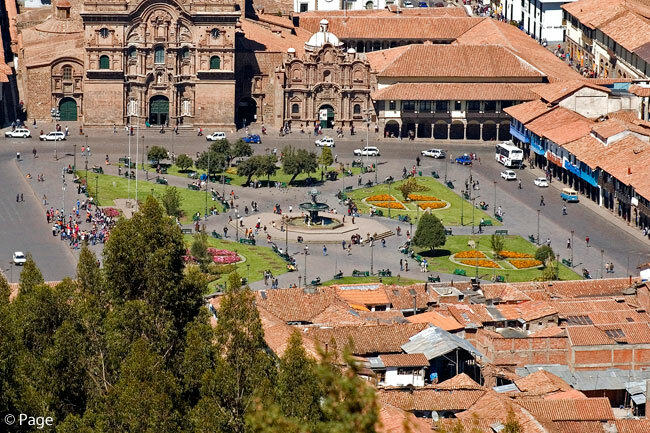 Colonial cathedrals and other Spanish architecture can be seen today in Cuzco, most prominently in the center of town at the Plaza de Armas. Fortunately, the Inca structures were not lost. In fact, my favorite part of the area are the Inca ruins. Today, the ruins of these walls can be found throughout the Cuzco region. They are not only in the city, but in surrounding towns; the most famous complex being Machu Picchu. 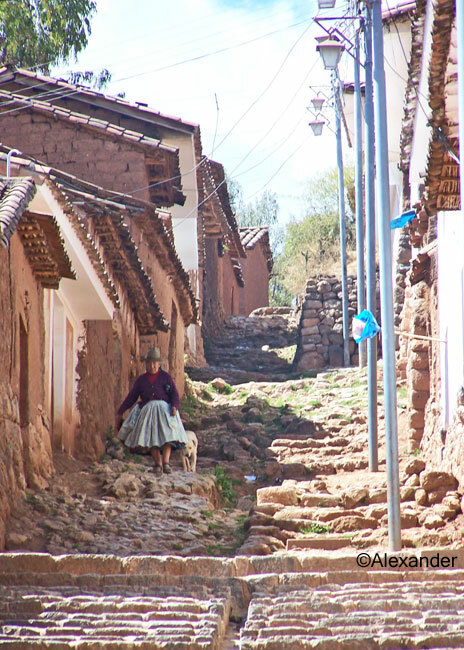 With the vast array of incredible stone masonry from the Inca, as well as colonial architecture that still stands, it is easy to wander around in Cuzco and its mountaintops imagining life as it was in earlier centuries. Looks like a very different place to visit. Yes, it is different, and fascinating. I would guess that with your imagination, you could conjure up all kinds of other-worldly adventures from a place like this. Many thanks, Craig. I sure could. There are a lot of alien theories surrounding those stone walls. Excellent overview and photos, Jet. A place I would love to see someday. Athena’s images of the weavers and the Cuzco woman are particularly striking. Hope you had a good holiday. The weavers and native women were especially photogenic, I am glad you enjoyed the photos, Jane, I did too. As for the holiday, I would imagine you are as delighted as I am to have some rain and clear air at long last. yay! You can see in the photo from Chinchero that the Incas did not use mortar or any kind of cement to hold their walls together. They started with one center stone and then shaped and smoothed the adjoining stones to fit like a puzzle. The stonework is amazing, and the lack of mortar is astounding, I agree, David. Due to the altitude, I had to rest often to catch my breath, being used to sea level. I sat often on those rock walls just studying the craft work. Thank you rabirius — glad you liked the Cuzco post. Thanks for taking us along on your trip to Peru, Jet. Your photographs are wonderful. The alpacas look so cuddly! Indeed a pleasure to take you along to Cuzco, Jill. The alpacas produced incredibly soft wool, so yes, they must be cuddly. Always a joy to have you stop by, thank you. I adore the colorful textiles from that part of the world. I do, too, Jan. The textiles are colorful, soft, durable, and well-made. Thanks so much. Peru has always fascinated me, particularly the Incan stone walls. Their level of craftsmanship is easily comparable to the best work in today’s world. I always had my face against some stone wall, Allan, the smooth texture, the tight fit, absolutely fascinating. How it all fit together is astounding, and that the walls endured the Spanish conquest and earthquakes too is a testament to its excellent craftsmanship. We both find these walls fascinating. I just LOVE this post, Jet. So amazing! Thanks, Anneli. This was tricky to write because I had to narrow a lot of information down into a short summary. I really appreciate hearing that you enjoyed it, thank you. Great post! Love that wall! The Cuzco region is rich with these stone walls. They vary in color depending on the sub-section of the region. You would enjoy them in real life, too, I am certain, Bertie. Thanks so much for your visit. A great post that brought back memories– I backpacked this area 40 years ago; I imagine it has changed a lot. 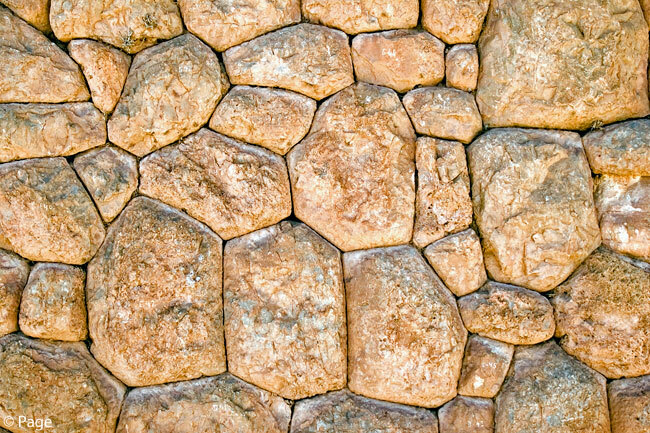 Those Incan walls with their tight angles always fascinated me as they didn’t have metal tools, only stone. The native Incan descendants are a hardy lot and amazed me with their strength/endurance and craftsmanship. I also loved the stark beauty of the altiplano. I’d say to backpack there you would have to be a hardy lot yourself, Eliza. The air is so thin. I LOVE knowing you backpacked here. Thanks so much. A wonderful post celebrating the colour and creativity of another country and culture. 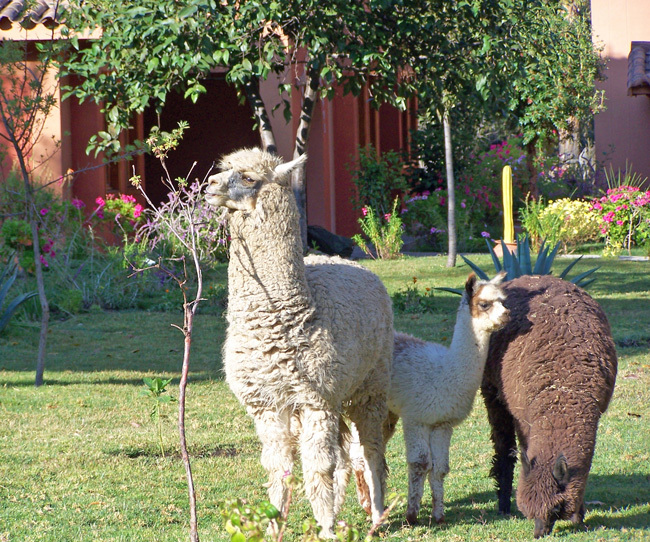 Plus the alpaca – what a delight! Really enjoyed this, and it’s good to read in the comments above you’ve received some rain and have better air quality. Thanks, Jet, and have a wonderful weekend! I am delighted you enjoyed this visit to Cuzco, pc, it is always a joy to have you along. The alpacas and llamas were wonderful. At Machu Picchu the llamas just ambled around on their own. What big mammals they are! And yes, we are happy to report we have had three days of rain and the freshest air ever. We’re all gulping it down here. My warmest thanks, and a pleasant weekend to you and Mrs. pc. Love the textiles and the stone walls. I’d love to see Machu Picchu someday. I think people there must be in pretty good shape, as there appears to be lots of up and down! 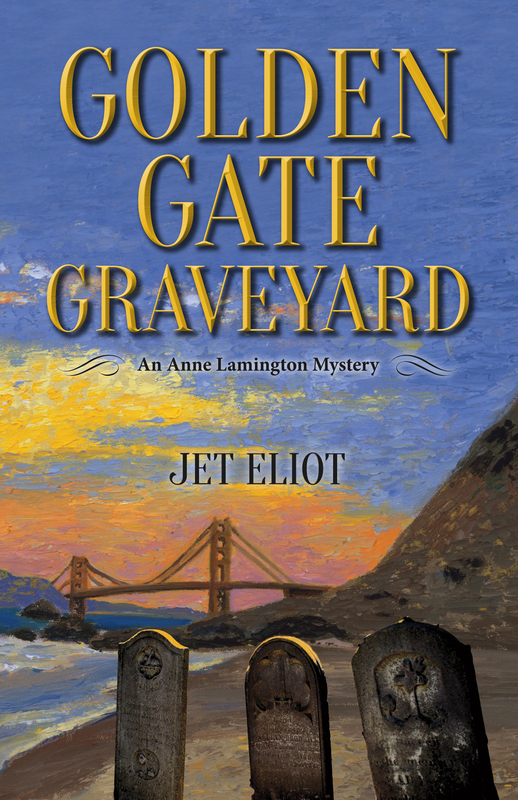 Thank you Jet, what a wonderful armchair adventure. The colors, the textures and the people are so beautiful. It looks fascinating but some what difficult to get around in and rather steep terrain. Yes, it is fascinating and exhilarating to be there, Bill. I would love to go back. The steepness was a big part of the whole experience, because the Andes are breathtakingly beautiful. Thanks so much for your visit, taking time from your own exciting travel adventures. Very much enjoyed this piece ~ next February I head to Peru and Cuzco. The Andes as you describe towering over all scenes, and show in your photos gets my heart beating with the opportunity to see such sights first hand. Wonderful post. Lucky you, Randall, going to Peru in February. I am happy you will see this magnificent place in the world. Thanks for stopping by and commenting. February will be the height of the rainy season ~ the only time I could go ~ so it will definitely be a unique experience 🙂 Very much looking forward to it, especially after this post of yours, Jet. Lovely place and I love the color of your new sweater. Thanks so much, Sherry. That new sweater was such a delight. Alpaca wool is so soft, a pleasure to wear. Warm smiles to you on this Thanksgiving weekend — hope you are having a pleasant time. Pam and I visited Cuzco and Machu Picchu 2016, not long enough to fully comprehend this city. Enjoyed coco tea and walk away with coco leaves. I, also, took many photos of the natives from a tour bus window. Thankfully, the windows were clean. It looks like a beautiful, fascinating place Jet, thanks for the tour! It certainly is Beautiful and Fascinating. Thanks so much, Andrea, always a joy to “see” you here. Have to get there. Thanks for this fine travel post. Truly a pleasure, Bumba, to share the beauties of Cuzco with you. Thanks very much for your visit and comment. Glad you liked the visit to Cuzco, Gunta. Travel since the fire has been just weekends away–our year of refugee displacement following the fire demonstrated our strong desire and need for a home and just one place to sleep. This trip was before the fire. Thank you for your visit, Gunta. Oh David, your poetic words always bring a smile to my face, thank you. Glad to bring you “way up there,” my friend. Beautiful photos and stories of this special place. I was there the week before last week. So very fun to learn you were just in Cuzco, Amy. And your reference to it as a “special place” reiterates my sentiments exactly. Thanks so much for your visit today. 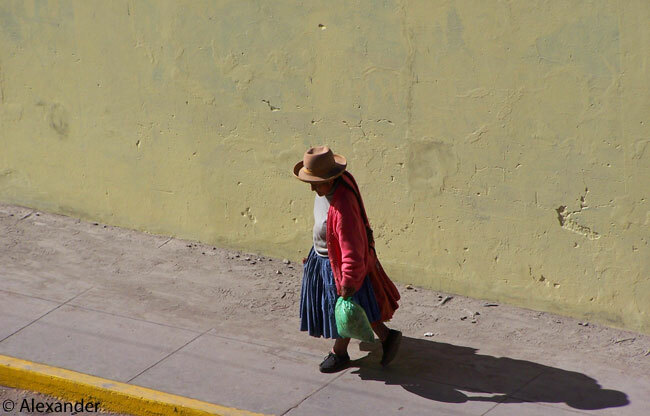 Love the photos as always – especially the one of the Cuzco woman. The closest I am likely to get to that part of the world is the herd of alpacas my friends have in the next valley over from us in Wales. They are fantastic creatures and so funny! Thanks again Jet for another fascinating insight to a part of the world I can only imagine, but imagine much more clearly for your posts. Wonderful pictures! I feel the thin air and the bright clear light! Oh how this comment thrills me Cathy. Thank you. My kids have been to Peru and they are going again next month. I envy you and them as it is probably a place I will never manage to get to. Thank you so much for sharing the ruins, the history, and the colors of present-day life in these beautiful places, Jet! Truly a pleasure to bring you along to Peru, BJ. So many places to visit in this big world, it’s good we have WordPress to make the visits so easy. Thanks so much for your visit. Yes it is. I love the global connections we all make through our blogging world 🌍! Have a wonderful week!! Thanks for the tour Jet, a most colourful and interesting post. 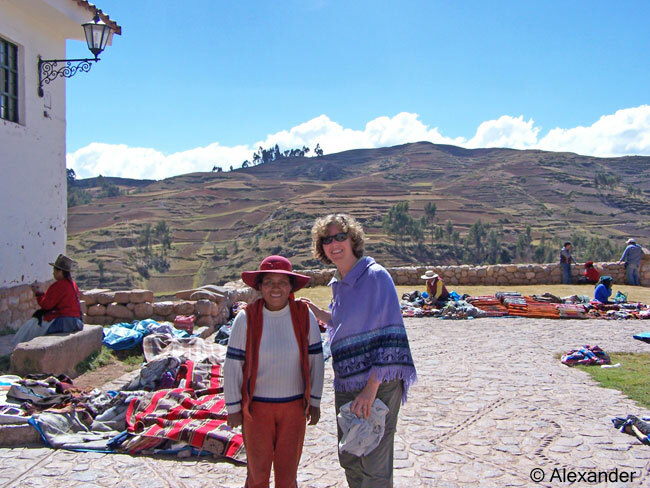 I am really glad you enjoyed the visit to Cuzco, Belinda. Thanks so much. It’s beautiful, thank you for sharing! Thank you, Wilson, I’m glad you enjoyed Cuzco. Oh, it’s so beautiful!! Say, those wandering Alpacas…do they let folks pet them? You should have seen me in Costa Rica! The iguanas were everywhere. I squealed from cuteness so much I’m surprised I didn’t lose my voice! I had to get dragged away from them. I just wanted to pinch their little buff muscles and pet them, that’s all (well, and feed them and hold them, but I would’ve settled). 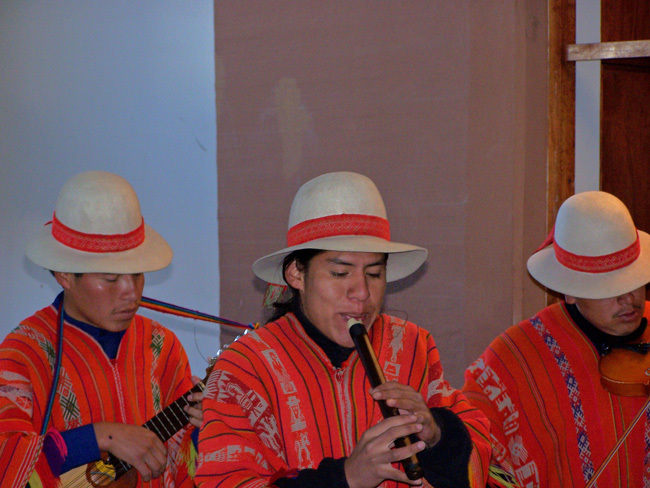 Those three flutists greeted us in the Cuzco airport and it truly was a sweet experience. I am happy to have shared the Cuzco delights with you, Nan, thanks so much, as always, for your visits. Thank you for sharing this unique town, Jet. The wall looks stunning. Who knows how old it is, but no stone has fallen out of the puzzle 🙂 The textiles are so colorful, and your sweater looks very soft and warm. What a pleasure to have you along for the Cuzco visit, Inese. You folks in Ireland are more accustomed to beautiful, ancient stone walls than many of us, so that makes me happy that you enjoyed Cuzco’s stunning walls. Thank you for your visits today. A fab post, Jet! Cuzco is an amazing place. I was there many years ago, and have pics of the experience. We travailed for 6 days through the mountains and many ruins. We wound up in Machu Picchu. I have pics, but they are old. The best for me were the ruins of the aqua ducts, where we bathed. It was the day before we reached MP. Not sure what to do with the pics. They are from the 70’s. They were taken on a Brownie Fiesta Camera. Machu Picchu is such a distinct place, we never forget our visits to this spectacular place in the world. Great to hear you’ve seen the marvels of the region, Resa, and how fun that you captured them with a Brownie. Many thanks for your visits. Jet how wonderful to be transported back to Peru. As you may recall we cycled in Peru and sometimes i think it might have been better not to be so active. Perhaps I would have absorbed more of the history. At any rate a delight to see Athena’s photos and have you walk me through the country once again. This area is so rich with history and beauty, I think no matter how many times we visit there is never enough time to absorb it all. Happy to revive your memories, Sue, and of course, always so happy to “see” you. Thanks so much. Thinking of you and Dave. Yes, I think you would really like it here, Jo…great walks. Your speed would be curtailed only slightly with the altitude adjustment, but a pleasant adventure to be sure. Always a joy when you stop by, thank you. Jet, this is a fascinating post — as well as beautiful. How fun that you got a photo with the lady who made your sweater! Hugs on the wing. I strive to buy handmade products directly from the artist when I travel, it eliminates a “middle man” and I have a special reminder of the region, too. It is especially fortunate when I can connect with the hands that made it. So, yes, you are right, it was really fun that this weaver allowed us to take her photo. My warm thanks, Teagan, and hugs back to you. I always enjoy these posts of yours that share the history and culture of your travels captured so wonderfully between your words and the photos by Athena and others. 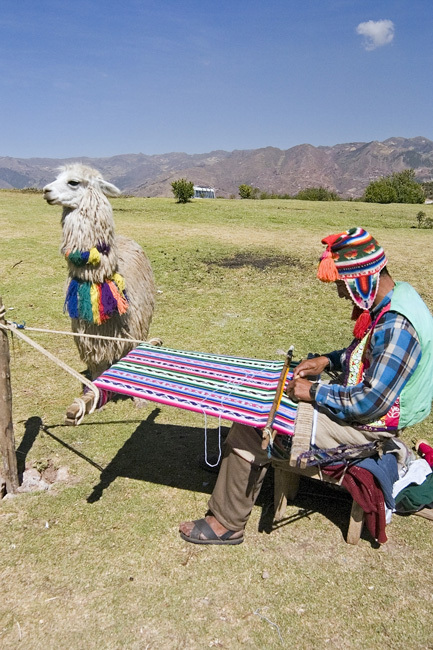 Love the wandering alpacas, photos of the weavers and the lovely sweater! So very wonderful to get your comment, ACI, thank you. It is a true pleasure sharing the magic of Cuzco with you and Gabby. Oh, it is indeed “art in stone,” RH, and there are remnants of the Incas throughout the region. Happy to take you there, my friend. Thank you. Peru and Machu Picchu are still on my bucket list. There is so much to see in terms of nature and culture that I better start planning soon 🙂 Thanks for this great post, Jet! If you do decide to go, Helen, I can recommend MP for two days. We stayed one night in the Inkaterra Pueblo Hotel and could go up early in the morning before the tour buses. Also, allow several days to visit the region, especially Cuzco and other ruins like Ollantaytambo. The train to MP is also really great. Glad you enjoyed the Peru visit, thanks so much for stopping by. Thank you, Jet! Will do. As a history buff, I am fascinated by the Inca ruins….great post!!! Glad you enjoyed the Inca ruins here, Kirt. I could never get enough of them, and I imagine you would feel the same way if you were there. Glad I could bring them to you, my friend. Delighted you enjoyed a jaunt to Cuzco, Janet. Yes, the colors there are vibrant, and yes, you would be painting portraits constantly were you to visit. There are still many people who dress in traditional weaved clothing, and are beautiful to observe as they move quietly through their days in the Andes environment. Always a joy to “see” you. I think that means you are home after your journey. Warmest wishes…. Your photos are beautiful. I was going to say the pictures with the Alpacas was my favorite but then I liked the Walking Stick…..and then another. Looks like a wonderful place. Thank you for sharing! Happy New Year! How nice to have you drop by today, Mazoli. There is so much to love about the beauty of Cuzco, I’m glad I could share some it with you. I love the photography, especially the simplicity of the people. I am already planing a trip to Peru for May 2020.Thanks for the info. Oh you lucky dog, going to Peru. I’m glad you are able to visit this magnificent country, Kelly. Many thanks for your visit.